Members of the community gathered at Joseph Bannon Park in Emery to pay respect to, and honour, all of our fallen soldiers. 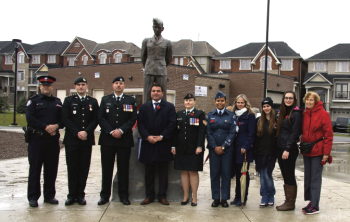 With many local seniors groups – including the North Islington Seniors Club – and community members present, Councillor Mammoliti read In Flanders Fields written by Canadian physician, Lieutenant-Colonel John McCrea. We are now in our fourth year of gathering around the Joseph Bannon statue for this service. Army staff and a Toronto Police Staff Sergeant were also in attendance and stood in salute during the two minutes of silence. Once again, Bannon Family members were in attendance to honour their father and grandfather. A local hero of the last World War where he served our country and community, with his wife and family. Hats off to Joseph Bannon, and the many others who went to war for us. Thank you to Vittorio Mazzucca and his passionate trumpet skills during the performance of The Last Post on his beloved trumpet. We also want to thank local service members. Major Eric Angell - Dennison Armoury, Lord Strathcona’s Horse Regiment - Captain Alex Whittaker - Dennison Armoury, Royal Canadian Regiment -Sgt. Jasmine Kriln - Canadian Forces College- Sgt. Nandalan - Air Cadets- Staff - Sergeant Michael Perreault - Toronto Police Services. 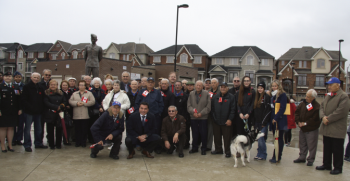 The Emery Village BIA was grateful for the community turnout and would like to thank everyone in attendance for sharing such a meaningful moment remembering those who gave their lives and continue to serve in the Canadian Forces.